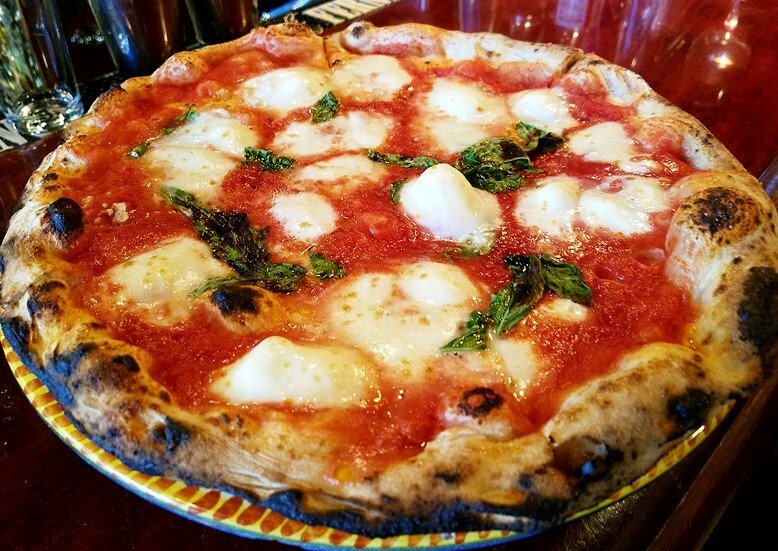 Travel: Tony’s Pizza Napoletana in San Francisco for a Plethora of Pizzas! When you talk about pizza, there are so many options and types that it makes it really hard to choose what the BEST pizza place in the country is. But the Daily Meal did just that, listing the 101 Best Pizzas in America and as a pizza fanatic, I’d have to say it’s pretty much spot-on! I’ve managed to knock a handful from the top 10 but I was so excited to try Tony’s Pizza Napoletana during a visit to San Francisco. Owner Tony Gemignani has won a bunch of competitions for his pizzas and pizza making skills so it was time for a visit. When I lived in San Francisco back in the early 2000’s, I used to always complain about the lack of good pizza. Well, it looks as if that has totally changed in the city by the bay! 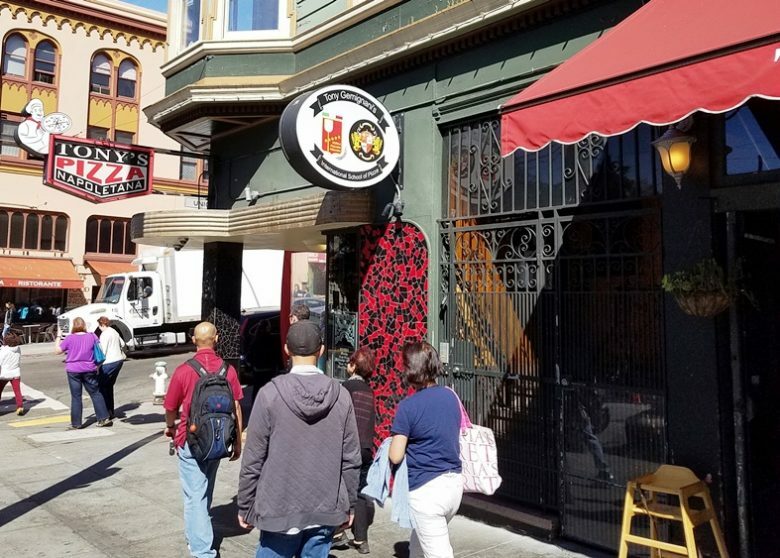 Head on over to North Beach and you’ll find Tony’s Pizza Napoletana on a little side-street of Stockton Avenue. A stone’s throw away from the beautiful Saint Peters and Paul church, this neighborhood is considered the Italian section of San Francisco but is pretty touristy at this point and time. I pop into the restaurant and it’s quite busy at even 3pm in the afternoon! Given I’m dining solo, I grab a seat at the bar and plan to do the best with my limited space. I’m handed over a beer list and large, multi-page menu which surprises me but I quickly understand why. While I’m sipping on my beer, I realize what Tony is trying to do here. 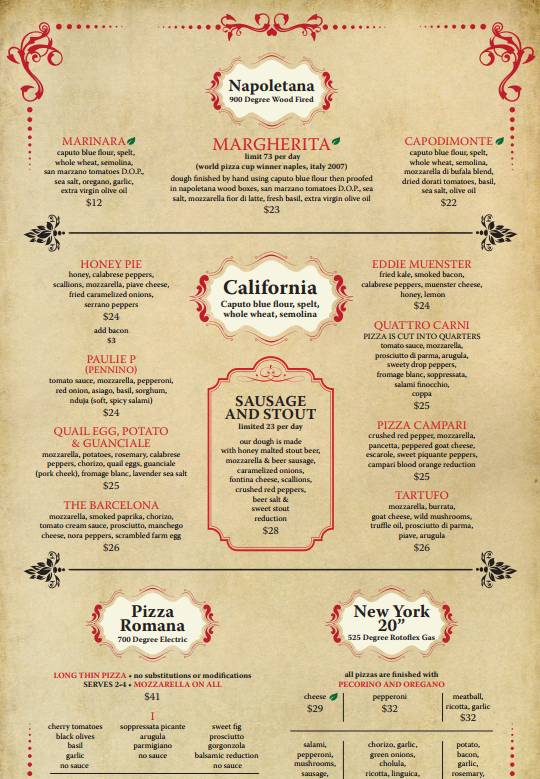 As a pizza lover, the menu here at Tony’s Pizza Napoletana tries to cover ALL the different types of pizza out there under one roof! From Neapolitan, to NY, coal-fired, classic American, classic Italian, Roman, Grandmothers, Sicilian, Detroit and even St. Louis (cracker crust). Each section of the menu has a short description describing the pie and the oven used to cook it up in, wow! Shockingly there’s not Chicago deep-dish on the menu but I’ve heard that Tony has a separate restaurant devoted to that style! Impressed by the diversity of za on the list, I try to stick to the basics and order up some meatballs and a margherita pie. 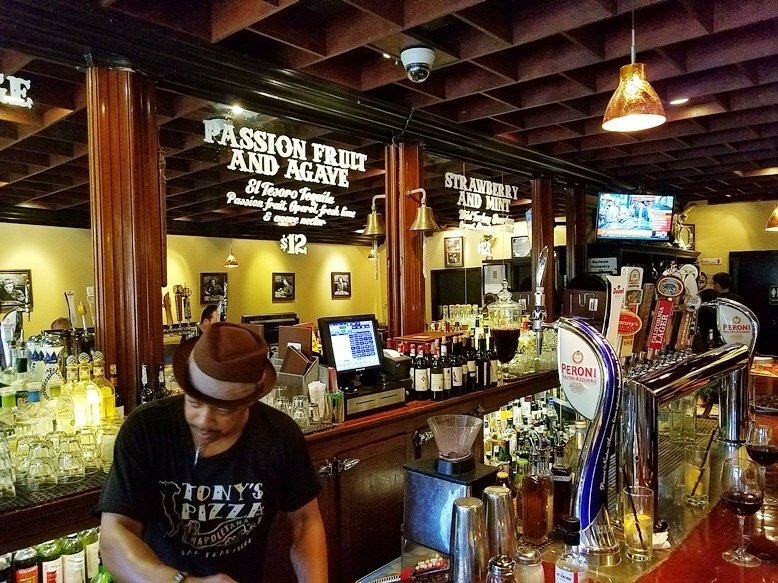 While sitting at the bar and checking out the crowd, it feels like Tony’s Pizza Napoletana could be your neighborhood pizza joint, but its fame and accolades has brought in tons of tourists and visitors. My bowl of three meatballs comes out and it looks beautiful! 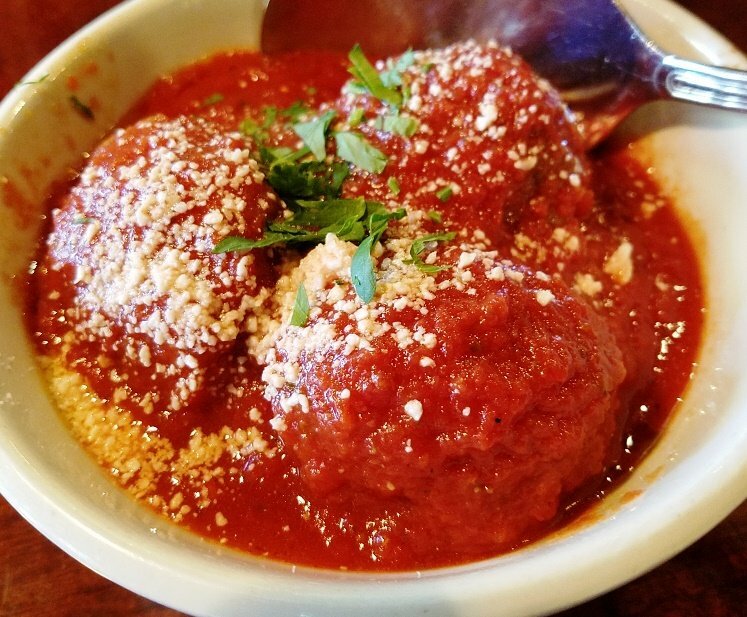 Three larger balls covered in a bright red marinara sauce and sprinkled with pecorino cheese. I dig in and they are delicious! Showing off a fine grind of what I’m assuming is beef and pork, they are super-tender and cooked perfectly. I try to limit my meatball intake to save room for the main course! Next up is my beautiful pizza! And while I was tempted to try the coal-fired pie, a margherita neapolitan is my measuring stick for great pizza and Tony’s Pizza Napoletana has done a stellar job here. The pie is splotched with bright white fresh mozzarella and adorned with dark green wilted basil. The sauce is bright and fresh with a bit of soft tang. 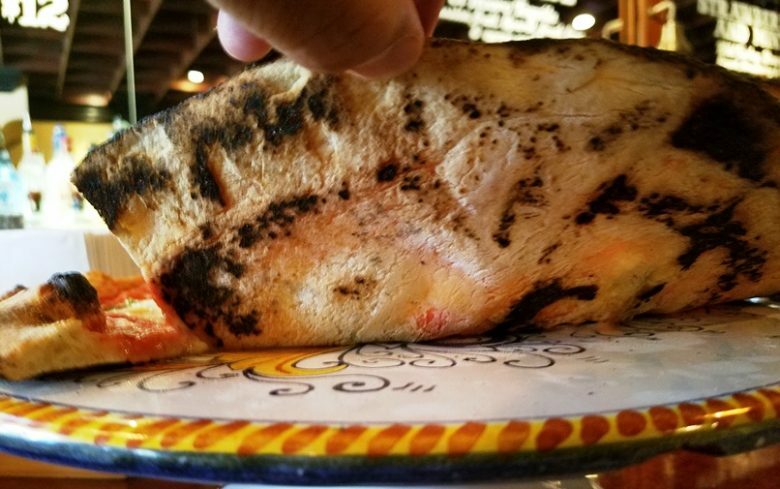 And while the crust is scorched a bit more than I’d like, it holds up well and displays a tender bite. Really an excellent Neapolitan pie, kudos to the pizzaiolo! I really wish I had more of an appetite or friends with me so I can explore more of the menu but no-go for this visit! 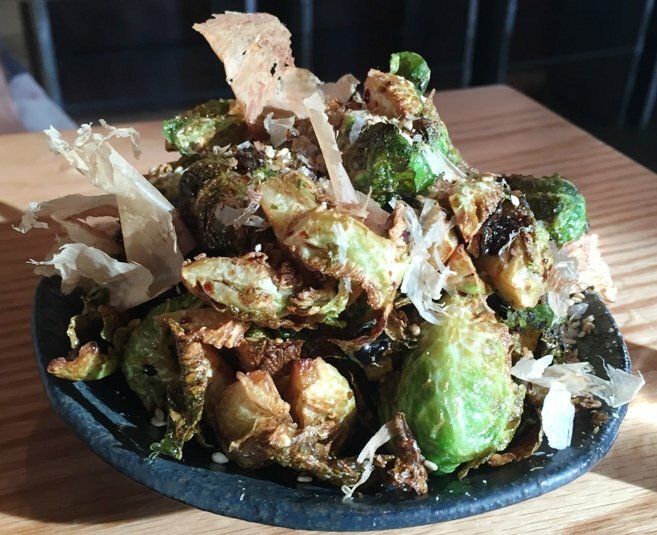 Travel: Kindred, Dishing out Fantastic Farm-to-Table Fare in Davidson, NC! 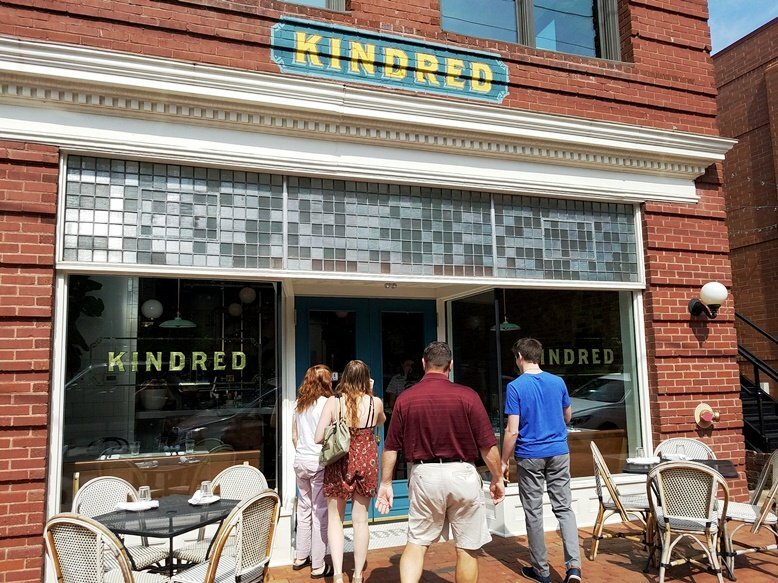 One of the great things about Kindred is its convenient location on Main Street in Davidson. 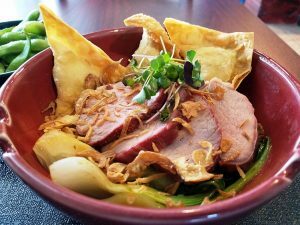 Given nearby Davidson College, there’s an academic feel to the city and you can stroll up and down Main Street peering into quaint restaurants and storefronts. 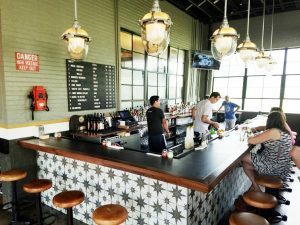 It’s got a quintessential Southern feel and charm to the area which is a lot of fun. And things don’t change much when you enter Kindred. Past its large pane glass windows lies a very chic and stylish space with minimalist aesthetics. 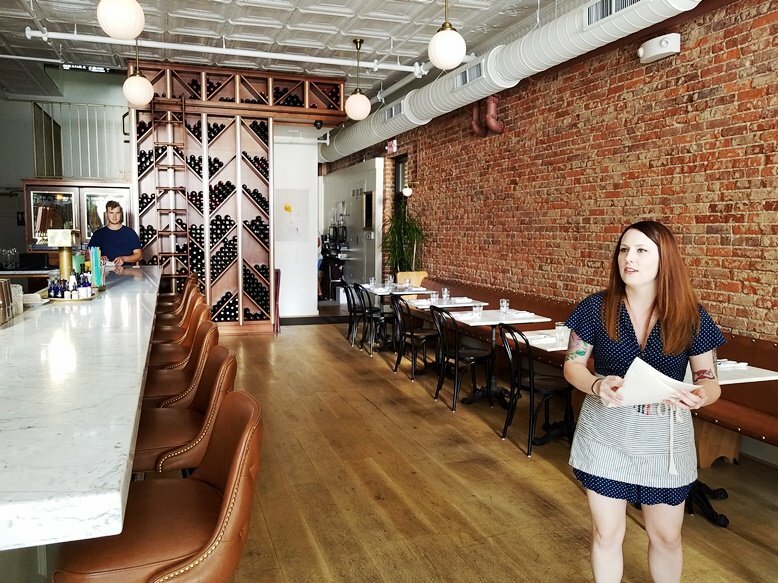 The space here at Kindred is bright, light and well designed with a centerpiece bar to the left and bricked wall to the right. Tables are neatly lined up on the right-hand side and Kindred also has a patio for outdoors dining, good stuff! We are led to a small 4-top across from the bar and seated with a very friendly wait-person who’s extremely knowledgeable about the menu. 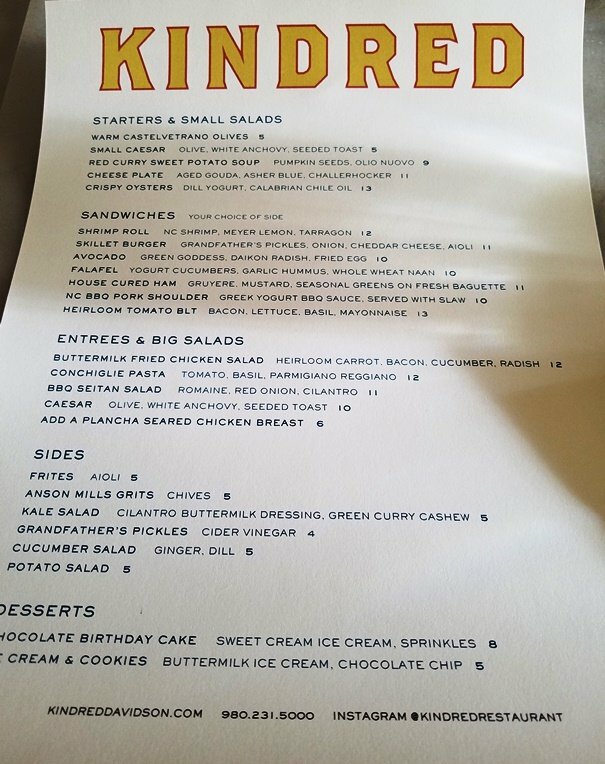 Kindred’s lunch menu is pretty tight with a handful of starters, sandwiches and a couple of entrees. 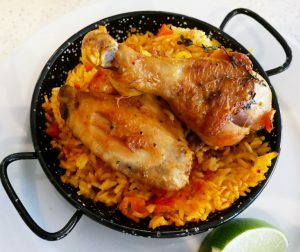 We’re trying to tag-team this meal to make sure we try not only what we want but as much as possible so there’s some horse-trading going on at our table given the delicious-sounding menu! After all is said and done, we decide to share out the crispy oysters, frites and Grandfather’s pickles. And I decide to go with the classic skillet burger with potato salad, yum! 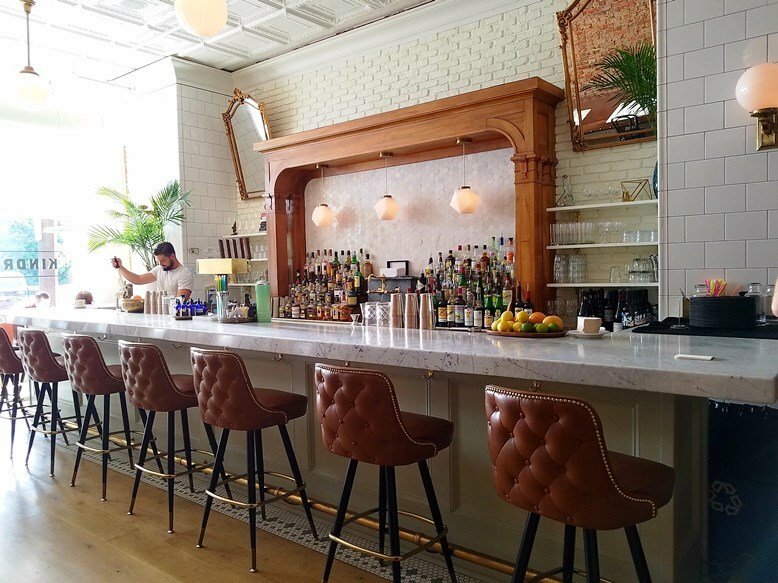 Looking around Kindred’s dining room, I can tell you that it draws a very affluent and Southern crowd. The crisp oysters come out first and it’s a visually beautiful dish! 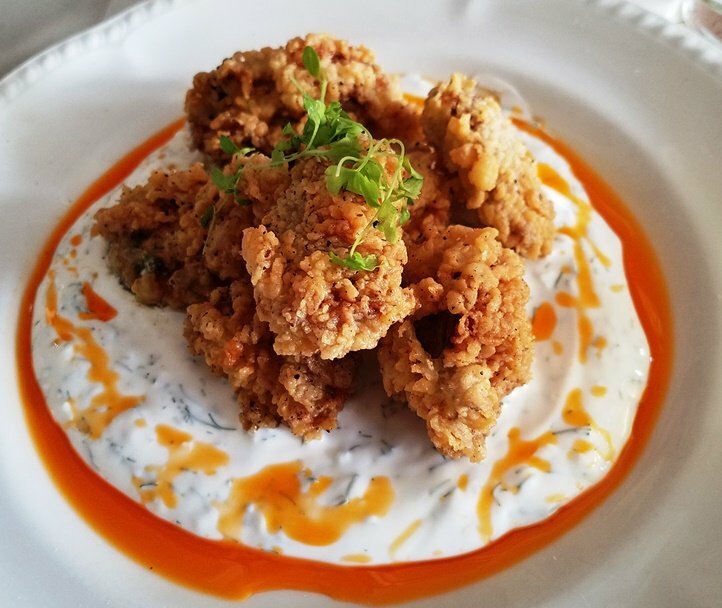 Crisp orange-brown bivalves sitting on top of a creamy yogurt sauce (tzatziki style) and peppery Calabrian chile oil. It’s a delicate plate despite its fried nature and the crispy crunchy seafood plays well with the creamy sauce. We then jump into the fries and pickles and they are awesome! 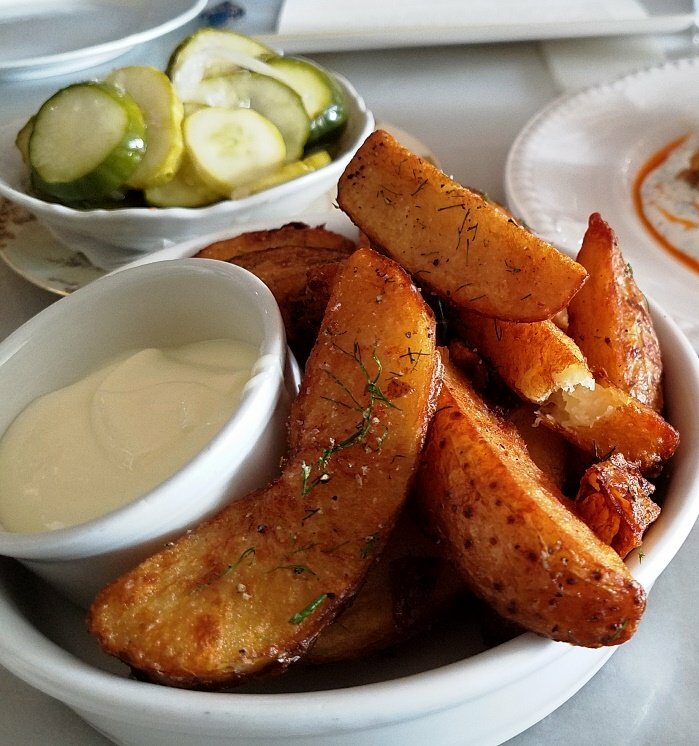 Kindred’s fries are lightly battered with a bit of dill flecked underneath and paired with a fresh aioli. And the quick pickles with shards of white onion are a fresh and crunchy bite and acts as a good palate cleanser. 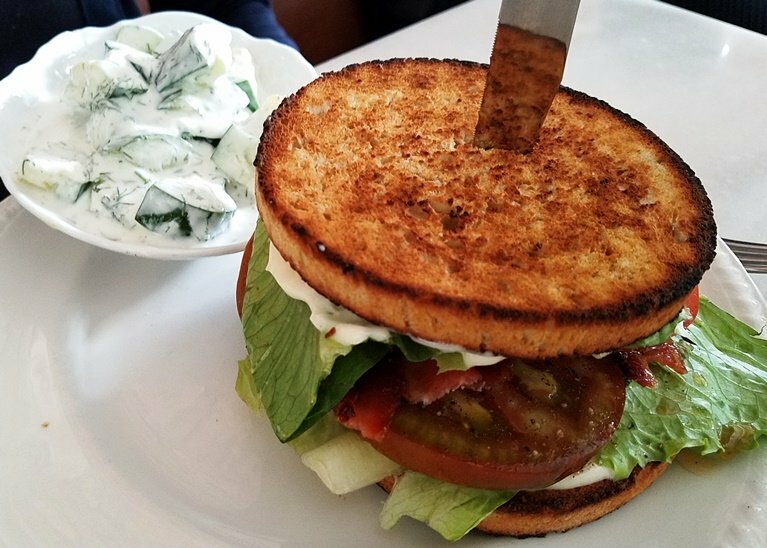 Our sandwiches arrive at the table and we’re looking at the shrimp roll, BLT and my burger, fantastico! And while I’ve eaten my share of burgers, Kindred’s rendition is a thing of beauty. Two small, seared patties with lovingly melted cheddar, bits of onion and aioli, wow. 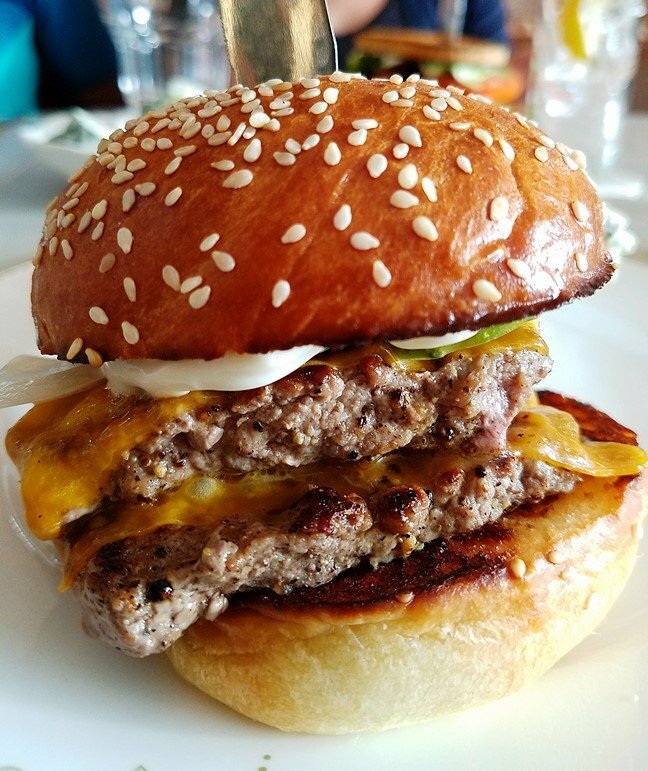 The burger is small (4 – 5″ across) but delivers a mouthful, given the stacked ingredients. 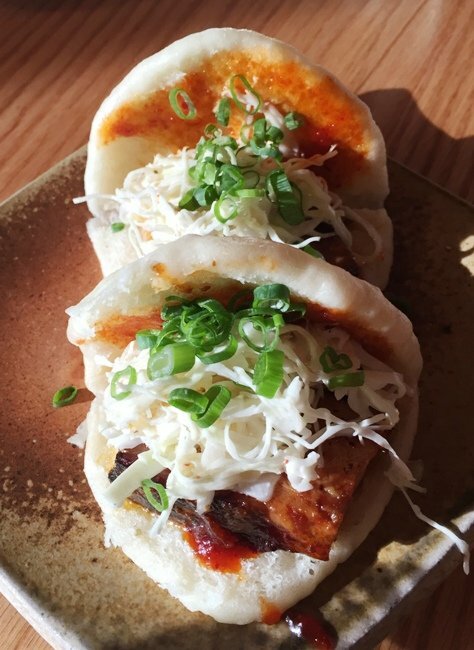 Kindred uses a wonderful sesame seed bun that’s been buttered and browned on the grill. Taking a bite results in a wonderful mix of beef, cheese and tang, the burger patty has been salted a bit and seared perfectly. My tablemates’ shrimp roll and BLT looks awesome, Kindred really cares about presentation even with its simple lunch offerings. As we dine, the dining room quickly fills up with hungry locals and sadly, we have not left enough room for dessert but I’m sure they’re excellent. Overall our visit to Kindred was totally worth the stop on my way to Atlanta. 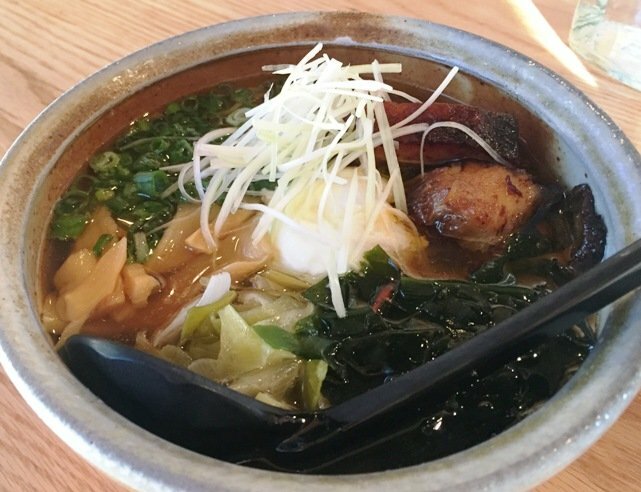 Chef Joe at Kindred shows a lot of love for his eats and all the little details are covered in terms of decor, service, ingredients, plating and preparation, kudos! I’m already negotiating a return visit for dinner here because I feel that lunch is just a small reminder of what they can probably do for dinner. So I’m hoping to get back to that area, stat, for dinner at Kindred or their upcoming project, Hello Sailor on Lake Norman in Cornelius. 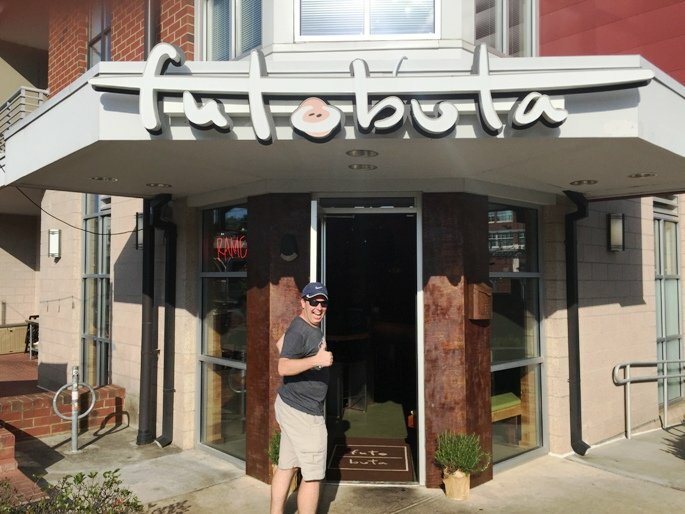 Their food is so good, it’s worth a 2+ hour drive down south from the Triangle, enjoy! If you haven’t heard, the 22nd Piedmont Farm Tour is coming back to the area on April 22nd and 23rd! For $30 per car, you can tour 35 farms out in Alamance, Chatham, Orange and Person Counties 45 minutes west of Chapel Hill and Durham. It all sounds really cool to connect with the NC food system here and really understand how your local food and meats are produced. 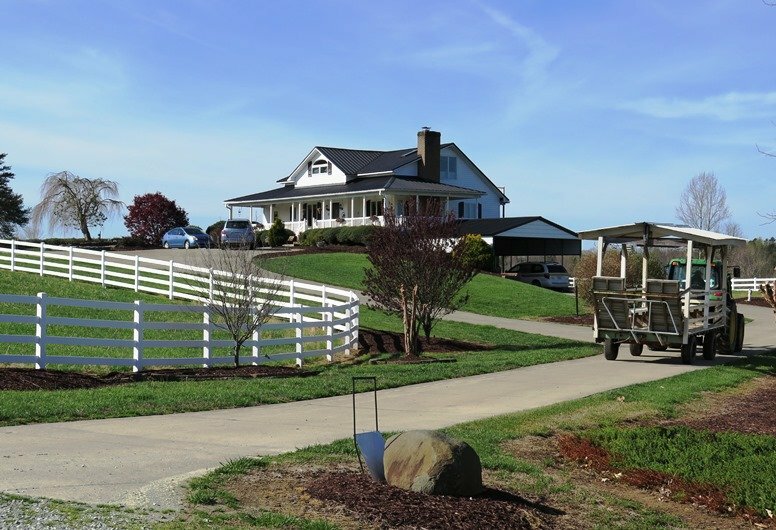 And as a preview of the Piedmont Farm Tour, I made an early visit to one of the farms on the tour that caught my eye: Sunset Ridge Buffalo Farm where I met its owner, Jack Pleasant. So off I go, headed out on a beautiful Saturday morning to go see some buffalo and get a feel for all the work that goes into caring for these beautiful animals. As I pull into Sunset Ridge Buffalo Farm (70 minutes from Raleigh) and find a parking space, I scan the scenery at this beautiful farm. Majestic white ranch house on a hill to the left, pavilion on a pond in front of me and then a equipment area and delivery van to my right. Jack pulls up shortly in a green tractor, pulling a tour trailer behind him. 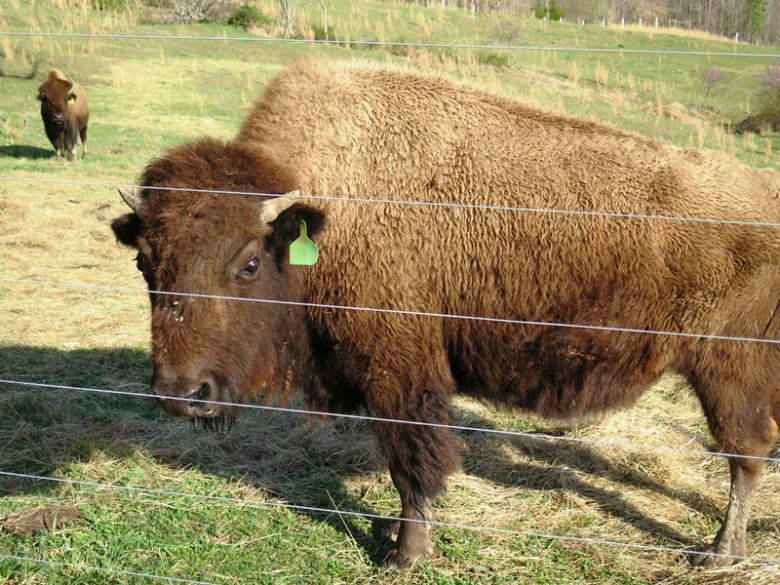 After exchanging hellos, we chat a bit about his background and how he got into bison farming! As a retired healthcare services executive (and Tarheel), Jack had a part of the farm passed on to him from his family. And over the years, he purchased other parcels of land to create the 250+ acres that make up Sunset Ridge farm today. As a healthcare professional he appreciated the the nutritious and healthy profile of buffalo meat as a protein which got him interested in raising buffalo meat for the local population. 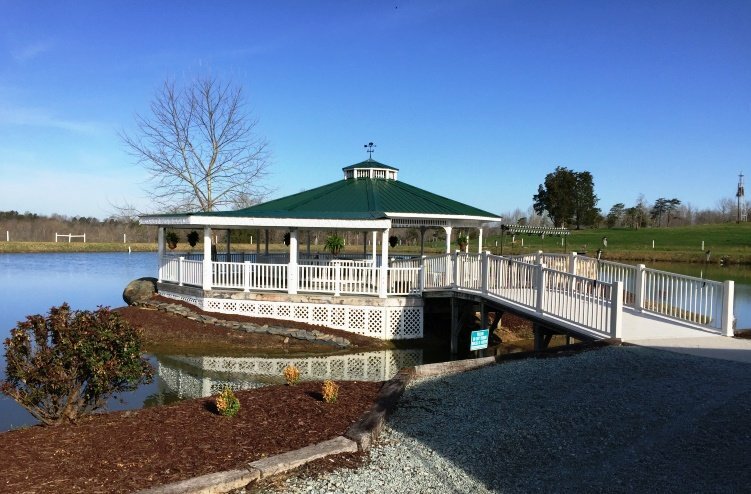 Sunset Ridge Buffalo Farm is also an event venue for wedding, parties and other special occasions! Fast forward to 2017 and the farm has two herds of buffalo totaling about a 100 animals. It’s the second largest buffalo farm in NC and he sells the buffalo meat locally at the Durham and Carrboro Farmers Market! Or you can visit the lovely farm and purchase the meat onsite. After chatting a bit, we jump into a utility vehicle and head over to the first herd. And up on a hill near a worn building I see them, buffalo! They are majestic animals with that signature, thick brown pelt. Jack tells me that since they’re only semi-domesticated, they can be a bit unpredictable so a bit of caution is recommended. And given that there are so few buffalo in the area, Jack has had to learn all the husbandry, care and knowledge to raise these animals. It’s really amazing to seem them in these herds with their calves, adults range from 900 to 1,100 lbs so they are solid beasties! And they definitely don’t exhibit that languid, soft feeling that domesticated cows give off. Jack feeds all his buffalo hay along with the natural grass and estimates that only 10% to 15% of buffalo meat is truly grass-fed which I’m sure, gives it a unique taste profile. We head off to the second herd on the lower pasture to do a quick interview. This herd seems to be a bit bigger and are pretty excited when they hear the Polaris Ranger come around the corner. All the buffalo have their ears tagged which gives them a cute, cartoonish face, they look like hipster buffalo! We hop out, get the camera set up for some Q&A and thankfully, the buffalo are really chill while we video. There’s more good info about the farm for you in the video, check it out. For the Piedmont Farm Tour, Jack will be doing 30 minute tours of the farm and herds. 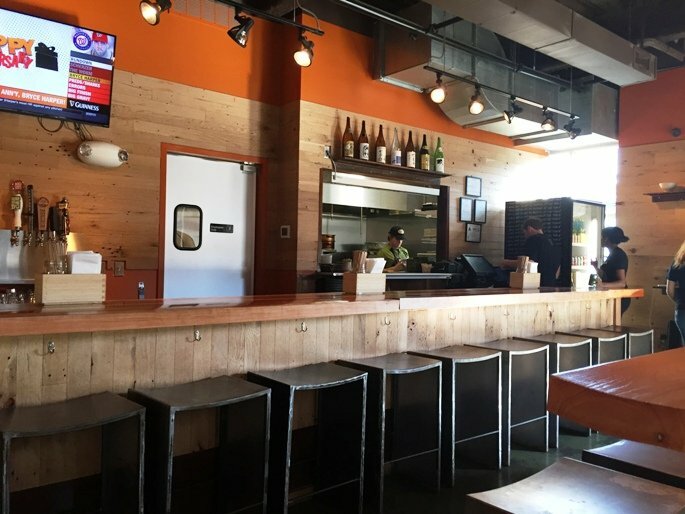 Afterward, you can head on out to the pavilion where he’ll have a chef preparing all sorts of buffalo goodies for you: burgers, sliders, bratwurst, jerky and more. And part of you may be thinking, how can you eat that buffalo meat after seeing these majestic animals? And I’ll be honest with you, as an avowed meatatarian, I was concerned about meeting these beautiful animals face to face. 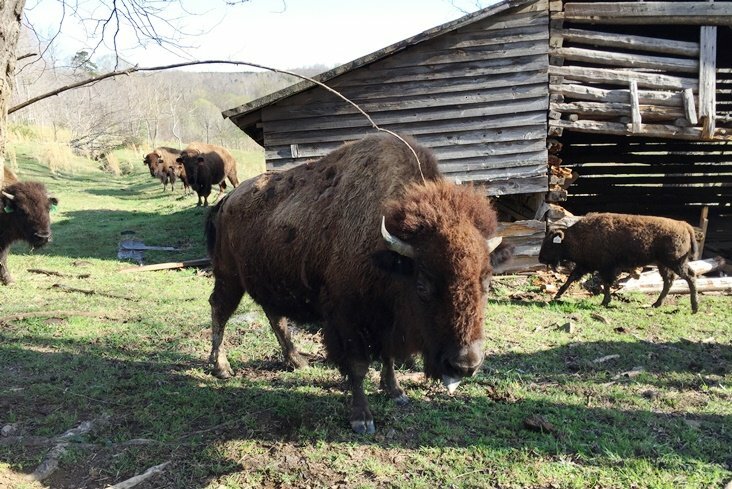 But it’s good to know that these buffalo are leading a good quality life and are being taken care of properly by dedicated farmers like Jack Pleasant. And if anything, I’ve grown an appreciation for all the work and passion it takes to bring these animals to market. Jack may be retired but he is definitely not resting, that is for sure! 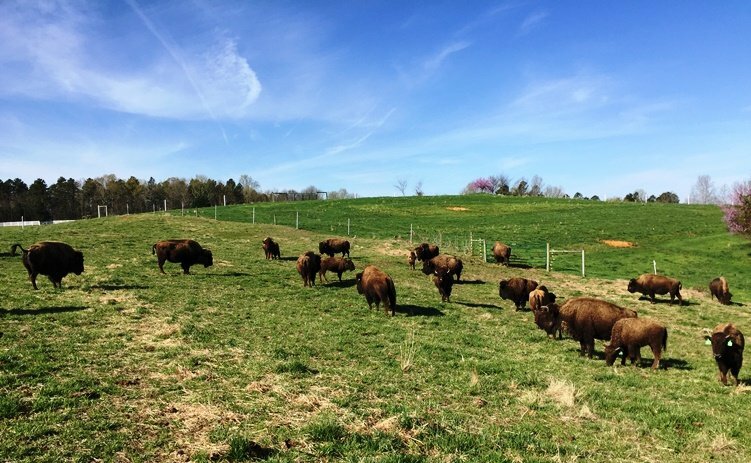 So if checking out the 2nd largest buffalo and bison farm in North Carolina sounds intriguing, come on out to the Piedmont Farm Tour on April 22nd and 23rd! Details are here and if you can’t make it, you can always try to arrange a personal group tour (12 or more people) of Sunset Ridge Buffalo Farm with Jack. Overall I can tell you that it was an impressive visit with these beautiful bison. And I also went home with some buffalo meat which I’ll try out this weekend. 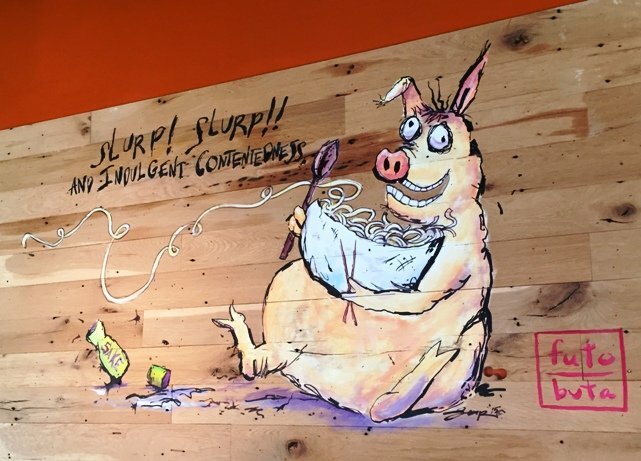 I can truly say I have a new-found appreciation of the meat I consume and getting a better understanding of the NC food system has been enlightening for this foodie. And I’m pretty sure the Piedmont Farm Tour will be one of the best chances you have to get an up close feel for the farmers in the area. Bring the kids, bring the family and prepare to experience life as it used to be and could be! 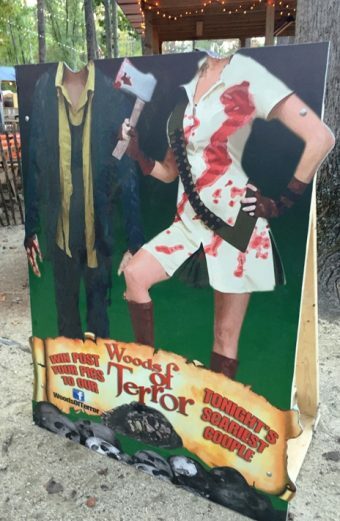 Media: Woods of Terror in Greensboro for a Frightfully Fun Evening! If you’re a fan of Halloween, horror movies and monsters, then who wouldn’t check out a Halloween haunt this month? There’s nothing like the creepy chills you get while watching a scary flick but it’s even better doing it in person during the season. And thankfully, you’ve got several Halloween haunts in the area and one of my faves is the Woods of Terror out in Greensboro! I have been to Woods of Terror several times as a paying customer and recently got to re-visit during a media preview event. And I can tell you that it’s still filled with thrills, chills, frights and bumps in the dark to get your heart racing! Located on a lonely stretch of Church Street north of downtown Greensboro, the Woods of Terror is about an hour-plus ride from Chapel Hill or Durham, about 90 minutes from Raleigh. If you wanted to, you could stop in Mebane on the way out to do some shopping and make it a day trip. 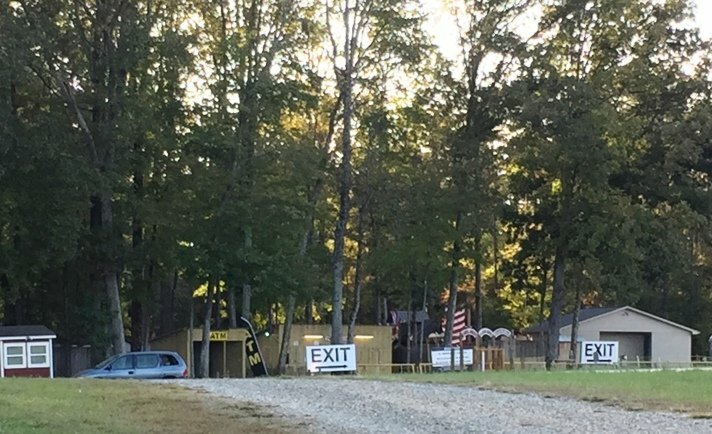 Use your GPS to get out here, you’ll roll into the Woods of Terror parking lot and it seems pretty innocuous out front. Tickets can be purchased online and run from $17 to $42 for general admission or a Fast Pass, parking is another $5 per car. Woods of Terror is primarily open from Thursday to Sunday but will also be open on Halloween Monday for your spooky pleasure! During the media visit, we get a chance to visit backstage and watch the make-up being put on. It’s a herculean effort with the Woods of Terror actors helping each other out into costume, makeup and more. It’s a young crew as you can guess, but they’re so enthusiastic and excited to make your Woods of Terror a fun and frightful experience. And the actors are the key differentiator at Woods of Terror in my opinion. 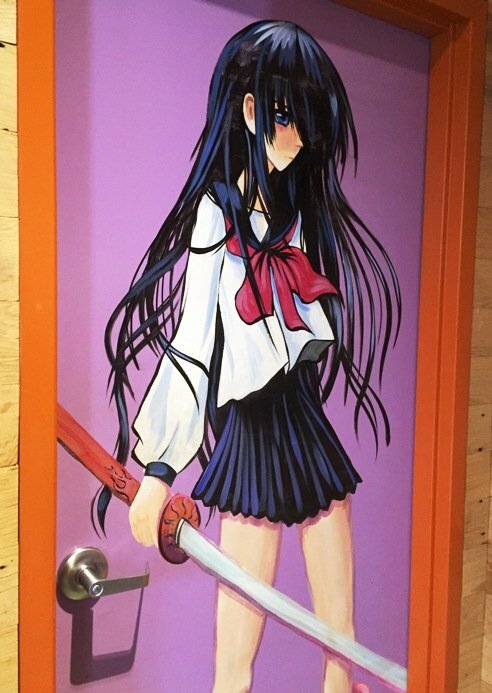 I’ve been to other haunts and they are well-trained here. The Woods of Terror “monsters” are not allowed to touch you but yeah, they will get as close as possible to keep you on your toes and the hair on the back of your neck, standing. Woods of Terror typically has 150 or so actors onsite to scare you during your visit. Every evening, they start off with a parade of terror led by a silver casket-mobile. 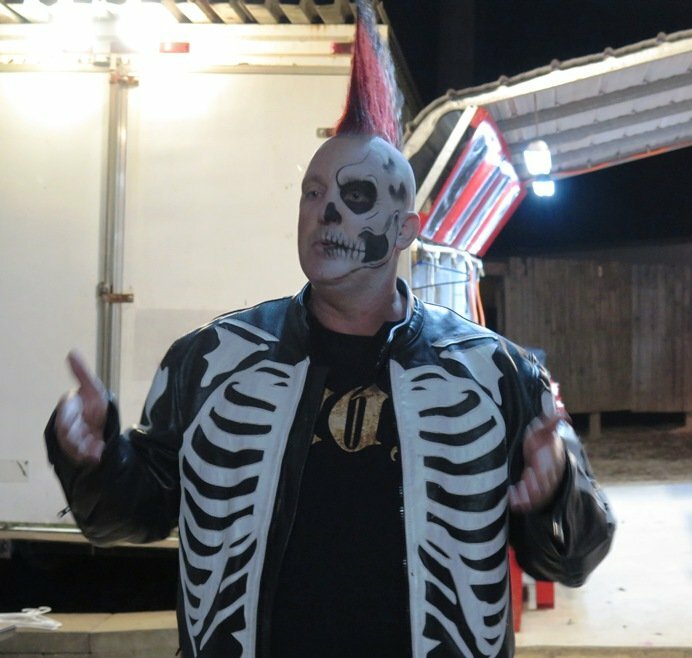 The owner Eddie gets into the act, sporting skeletal face-paint, a spiked mohawk (it’s real) along with a beautiful albino python draped on his shoulder. It’s a fun start to the evening and great way to get the crowd and actors excited. After the parade and national anthem is played, the ghouls, monsters and creepers head on out into the Woods of Terror and lie in wait for you. While the lines can get a bit long on the weekend, The Woods of Terror has a midway area to keep you entertained with food, games and distractions up front but dress warmly for those chilly October evenings. We get to enter the haunt through a back entrance and while I unfortunately, can’t take any pics on the haunt, I can tell you it’s a lot of fun and as good as I remembered. You’ll run through some very complex stages like a Texas chain-saw massacre house, vampire crypt, haunted circus tent, fun-house, fog, laser lights and a lot more. You may run into Michael Myers, Freddie Kruger and more creepers that you’ve seen in the movies. There will be darkness, loud noises, and other sensory stimuli to keep your fears ramped up but it’s all in good fun! Now the Woods of Terror can get intense at times so if you’re bringing kids along, make sure they are ready. My guess is 14 and up would be best but it all depends on the maturity of your son or daughter. In all honesty, I know plenty of adults who are too scared to go to Woods of Terror but isn’t that the whole point of going to a haunt? The Woods of Terror can get pretty busy during the season and anticipates over 30,000 visitors over the course of October. I’d suggest coming early on a Thursday or Sunday night to minimize wait times. But it’s worth it in my opinion and a great way to get into the mood for Halloween! 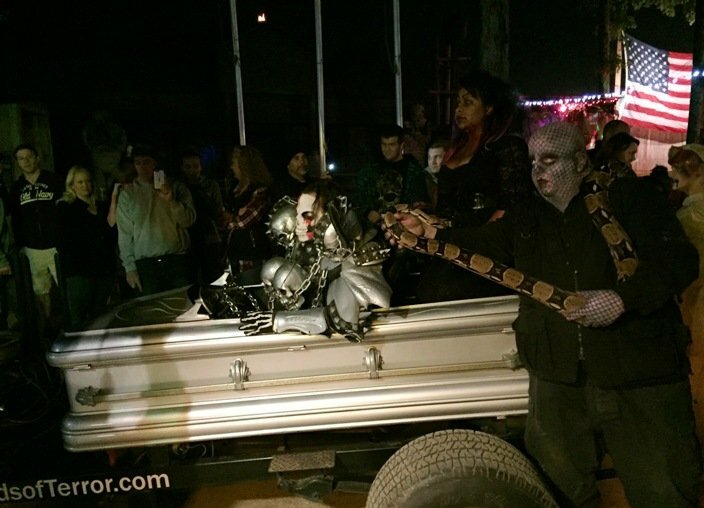 If you’re up for a scare and got the gumption to take on the Woods of Terror, it’s a fun evening and worth the ride out from the Triangle….